BA+JP recently sat down with the artists behind The Feminist Art Project. Check out this week’s Profile Spotlight. Remember – if you get on the map, you may get to be in the Spotlight! 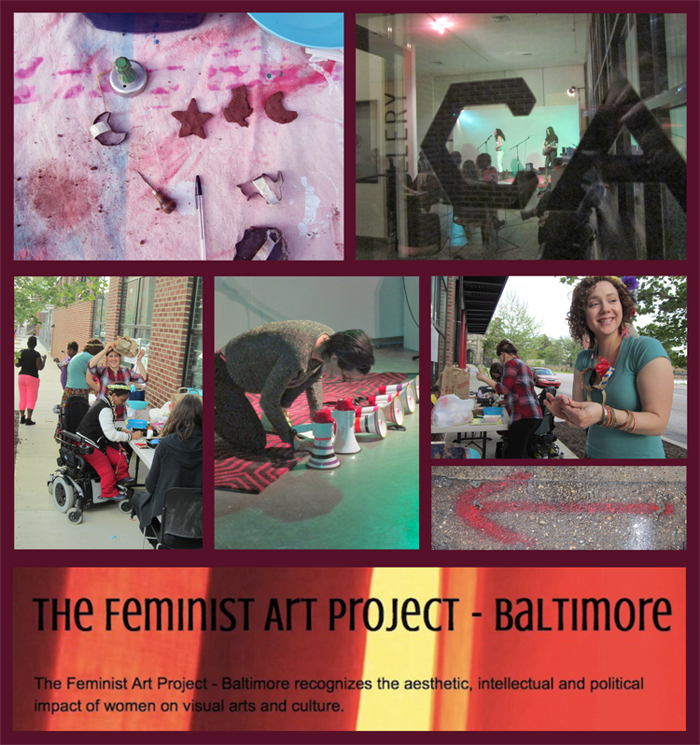 Combined,we are about 65 years old…but The Feminist Art Project- Baltimore is a wee 7 months old as of May. We have a quite a few interested and active members living in the City Arts building, so we find ourselves in the neighborhoods of Station North Arts and Entertainment District quite a bit these days. Several of our members are self-identified community artists and teachers, so we have been living and working just about everywhere in Baltimore at this point. TFAP-B is a new organization under the cap of a much larger, older international organization, The Feminist Art Project. We aim to create an ongoing platform which uplifts the voices of female artists, women in community, as well as those within our own membership. The partnerships with community that we forge will allow for further connection and help build confidence in our communities, while illuminating the good work of our partners. In addition to monthly meetings, we have planned a total of four public events, several of which are upcoming. The first was a free performative event in January, “Speak Up”, featuring Cali Bulmash and Emily Lowinger from the Slam Up Tour (slam poetry/music) as well as local, Baltimore-based female performance and video artists. We are currently working on organizing our first exhibition entitled GUTSY: Taking the Fear Factor Out of Feminism and are still accepting submissions. GUTSY will be will be opening Artscape weekend at Gallery CA, a part of the 2014 Artscape Gallery Network. 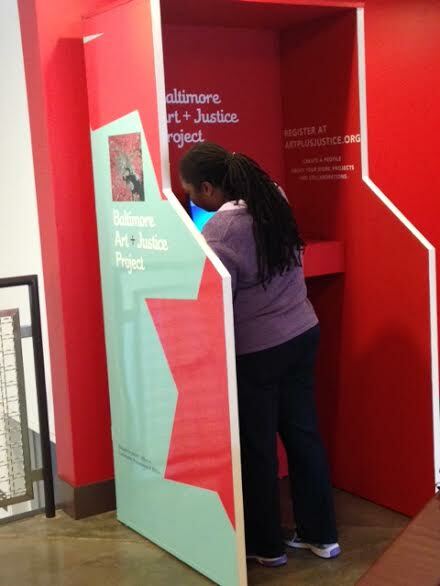 An important component of this exhibition is reflected in TFAP-B’s mission of supporting women in Baltimore. Twenty percent of sales will go to the local organization Power Inside, a human rights and harm reduction organization that serves women and girls who are survivors of gender-based violence and oppression. Because of the nature of our organization we’re particularly drawn to social justice issues that directly affect women, but we’re also interested in being inclusive and using art as a tool for further discussion, or raising awareness of issues that may otherwise have been missed. Shana: A good story. People who can tell a good story or anecdote are everything. Allison: Personally, I find Baltimore and the people living here to be the most inspiring. There are so many different kinds of people from different backgrounds and with different histories, people who have a lot and people that have next to nothing and the way that these things all intersect and affect each other can be really inspiring, or really depressing, it just depends on the day. Shana: I appreciate the love and respect that Baltimore has for its arts community. It is unmistakeable, and focused. It’s written all over the walls. Allison: Getting to know and interact with other artists and activists that are trying to make Baltimore and the world a better place to live in. Competing with your peers and friends for the same resources to support your projects. We’re open to almost anything as long as it is supportive of women. There are inequities inherent within the Art World as an institution and structure that are a direct reflection of our societal systems. Ultimately, we are interested in dismantling these systems…or at least messing them up. We just became a program of Fusion Partnerships Inc., and they are working with a lot of really amazing local organizations, one of which we’re already forming a relationship with, Power Inside. We’d love to continue partnering with a variety of organizations and other Fusion programs. We hope to do some outstanding work in B-more and help support those who already are. Please contact us if you have a great idea which supports our mission! Shana: It’s not local, but The Girl Effect, because (from their website) ”Girls are the most powerful force for change on the planet” …I believe that. And they have the greatest promotional videos which succinctly explain their cause, while also being emotionally resonant. They are works of art. Allison: Locally, I think it’s hard to choose, there are a lot of great organizations working here in Baltimore. FORCE, MotherMade, Hollaback Baltimore, Power Inside, they’re all working to address issues of social justice or issues of equity for women, I really can’t choose just one. Artists in Baltimore are embracing their communities by highlighting some of the issues of social justice we are all facing, within their artwork. Locally, Luminous Intervention and FORCE are just a few examples of artists ‘getting it done’. But there probably is not a wrong way to have a conversation, and that’s exactly what art can bring to the party. Artists here can ‘speak’ to sensitive issues, which are frequently tackled in social justice organizations, such as: sexism, income inequality, racial tensions, etc. This room/safe space allows for a new way to engage or enter into dialogue in our communities. More often than not, we are seeing artists consistently using their skills to illuminate both local and global societal issues. Artists and art organizations are really striving to make an impact here. Social Justice and art here in Baltimore go hand-in-hand, sometimes they are almost synonymous. There are some very blurry lines in Baltimore at this point, but art is making an impact so we’re certainly not complaining! To learn more about The Feminist Art Project, check out their profile at Baltimore Art+Justice Project! Get mapped!